This Grandmother's Garden: Oh Spring... where art thou? Early morning in my gardens... 22° F... brrrr! There is fresh snow on my Waterfall! Lovin' my Waterfall...through every season. And it will all be melted by tomorrow. We woke up to fresh snow and I couldn't wait to go out and take pics! Stay tuned for the series to continue in our next post, I promise. Same here! This beautiful picture makes me miss the snow, though. Oh my, snow! I'd cry, because we've already had weather in the mid 80's here. But this week we are more normal, looking for a freeze tonight. Boooo! At least it makes for lovely pics! We have 80 degree sunshine outside! Snow sounds pretty nice actually. Spring is certainly taking it's time this year. Here in CA it teased us a bit, then the weather turned summery for about a week and everything bloomed. THEN it started pouring rain for 3 days straight. What's a gardener to do? Love your blog title and look forward to reading more posts! Yet here we sit in the 80's today and it feels like summer. Your weather looks more normal. Atleast your falls in still beautiful. Oh my snow...we have had the warmest March and everything is growing and back including mosquitoes...i actually planted the cool weather veggies in the garden...hope your spring warms soon. Looking at your dusting of snow is feeling very cool right now. It feels as if we have jumped right into summer in my neck of the woods. 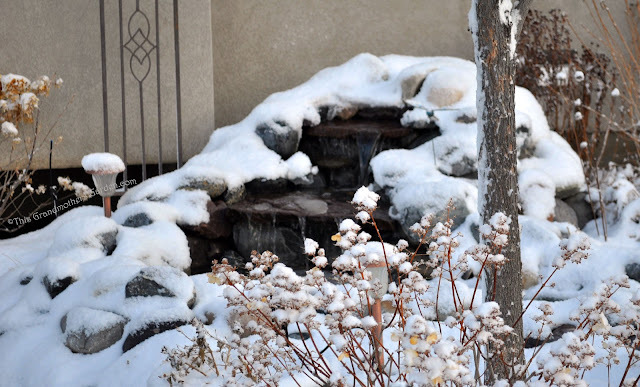 Your waterfall looks so lovely in its winter coat. And the snow was all melted by mid afternoon. Weather in Utah is crazy this time of year... they're forecasting 70's by Friday. I think early morning PJ picture takers are more abundant than we know... we should form a club. Oh that looks so beautiful Carolyn! Do you have the pump going all the time? Actually, no we don't... too cold in the Winter, it would freeze up solid in the basin. Besides, we aren't out there to enjoy it. The weather was warm and Spring like last week, so I had begun my Spring cleaning out there and turned it on to enjoy the sound while I worked. Even though it was below freezing when I turned it on, I knew that it hadn't been cold long enough to freeze the water in the basin and when the sun came up it would warm up quickly. Thank you Karin... still looking forward to Spring here, and hoping it will linger for awhile before Summer comes. I thought so, too! 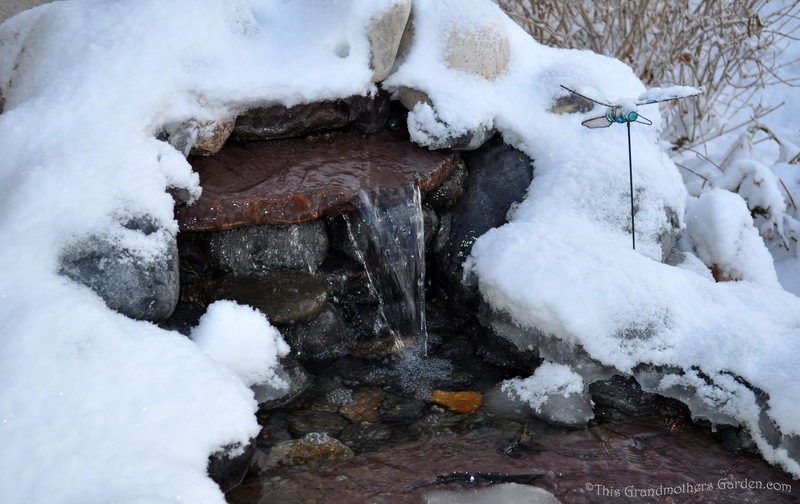 This was our waterfall's first Winter, and though we turn it off for the cold Winter months, I saw a Spring Snow (that would melt so quickly) to be the perfect photo op. I think snow might be in our past for this year. The weatherman said yesterday that we have hit record highs for the last four days, and expects the same for the rest of this week. We are in the 70's, so your snow looks chilly (and very pretty) here. Ooh, that was unexpected. We are having quite mild spring weather here in the UK at present. 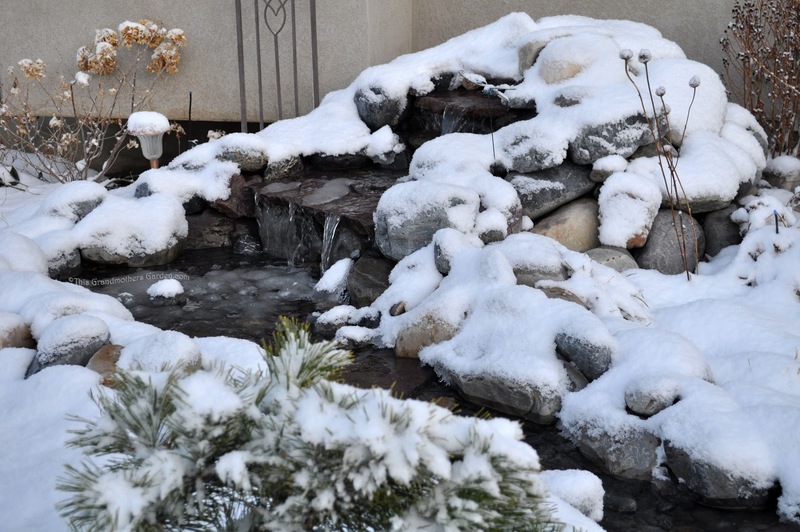 Your waterfall still looks lovely, even in the snow though.